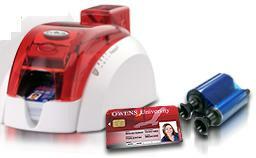 THE TATTOO 2 FULL COLOR ID CARD PRINTER WILL PRINT ONE SIDED ID CARDS IN JUST A FEW SECONDS. IT IS IDEAL FOR ANY APPLICATION. IT PRINTS 300 DPI STANDARD RESOLUTION AND NEAR-TO-EDGE PRINTING. THE TATTOO 2 PRINTS PICTURES, TEXT, BARCODES AND LOGOS.